Various land crabs have long been available in the pet trade, but despite their brilliant colors and fascinating behaviors, few have caught on among terrarium keepers here in the USA. This changed a bit when several spectacularly-colored species, usually sold as Vampire Crabs or Red Devils, began showing up in the early 2000’s. Recent investigations into the natural history of these crabs resulted in the surprising finding that two species new to science have been kept and bred by hobbyists for at least 10 years! I had long urged my bosses at the Bronx Zoo to pay more attention to terrestrial crabs, especially as many do so well in large planted exhibits. I was given some latitude, and happily established colonies of “Halloween Crabs” (please see photo), “Soap Box Crabs”, various members of the family Potomonidae and Land Hermit Crabs throughout the reptile house. We even kept the massive Coconut Crab for a (too brief!) period. But the time and money needed to study them properly never materialized, and I still wonder at the identity of some that passed my way. So I was quite happy to see that interest which germinated in the pet trade has resulted in an important discovery. According to a recent article in the journal Raffles Bulletin of Zoology (V. 63:3-13; 1/2015) two previously undescribed species have been found among pet trade animals commonly sold as Vampire Crabs. They were collected on Java, and have been named Geosesarma hagen and G. dennerle. Individuals vary in coloration, but in general they are bright orange and deep purple with cream blotches, respectively. Others I’ve kept, which exhibited similar lifestyles, sported shocking yellow eyes, brilliant red claws, and jet black carapace borders. As crab enthusiasts know, Indonesia’s many islands, as well as others in the Indian and South Pacific Oceans, support a fantastic array of terrestrial (and marine) crabs. 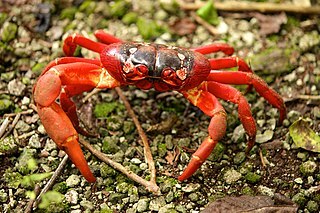 From the unbelievably-large Coconut Crab to the spectacular migrations of Christmas Island’s Red Crabs (please see photos), the region’s crab diversity is unmatched anywhere on earth. Some small islands support a dozen or more species, which seem to fill niches taken elsewhere by reptiles, amphibians and small mammals (or monkeys, perhaps, in the Coconut Crab’s case!). As seems to be true for the newly-described Vampire Crabs, many have long been isolated from relatives, so new species almost certainly remain to be found. Vampire Crabs and their relatives do best in moist, well-planted terrariums that allow climbing and burrowing opportunities. Live carpet moss and leaf litter over a topsoil/coconut husk substrate suits them well. Philodendron, Chinese Evergreen, Pothos, Cast Iron Plants and other sturdy species will add immensely to their quality of life and your enjoyment of them. Although only a mere 0.8-1.3 inches in length, these active little fellows will do best if given plenty of room. Although said to be nocturnal in the wild, most that I’ve kept were eager to forage by day once they settled in, especially if ample cover was provided. A temperature gradient of 75-85 F, and an ambient humidity level of 70% or higher should be established. Terrarium heat pads attached to the tank’s sides and red light bulbs will assist you in heating and observing your pets after dark. Most terrestrial crabs feed opportunistically on almost any organic material that comes along. However, Vampire Crabs seem more inclined to seek and chase down live prey than do many others – so much so, in fact, that they remind me of that most voracious of inshore predators, the Blue Claw Crab! As we do not know their exact nutritional requirements, I provide a highly-varied diet for all terrestrial crabs. 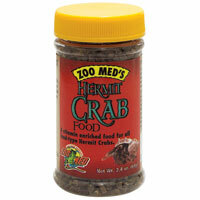 Vampires will readily accept Zoo Med Hermit Crab Food and many other diets formulated for terrestrial hermit crabs, freeze dried shrimp, frozen and flake foods marketed for tropical fishes, moist algae tablets and turtle chow, small live and dead crickets, black worms and other invertebrates, and some fruits and vegetables. Calcium blocks will be used by some species, and powdered calcium should be mixed into their food as well. I especially like to offer fresh leaf litter and grass clippings – all land crabs, including the popular Terrestrial Hermit Crabs, will eagerly pick through this material for small invertebrates, plant shoots, moss, lichen, decaying leaves and other tidbits that likely provide important nutrients. A shallow bowl of de-chlorinated water should always be available for soaking and breeding purposes (please see below). Some keepers report that Vampire Crabs are less inclined than others to hunt down and consume their molting tank mates (they are defenseless until the new exoskeleton hardens). I, however, have no faith in crab “sociability”, and so advise you to include deep substrate and many hiding places…along with lots of food! 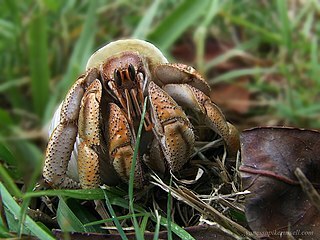 Unlike Coconut, Hermit and Fiddler Crabs, all of which require marine water for soaking and as a breeding site, Vampire Crabs have cut all ties with the ocean. Females carry their 20-50+ eggs about until they hatch or are ready to hatch, whereupon they are deposited in shallow pools of fresh water. Crab enthusiasts will be especially happy to learn that Vampires have thoughtfully done away with the planktonic larvae that have long prevented us from breeding others in captivity. Instead, tiny, fully formed crabs (crablets?) emerge from the eggs. They are said to chase down fruit flies and springtails in adult fashion; related species under my care have accepted other typical crab foods as well. People are often surprised to learn that Land or Terrestrial Hermit Crabs engage in complex social behaviors, are capable of communicating via “chirps” and, with proper care, may live for over 20 years. I’ve had the pleasure of working with them at home, in zoos and the wild, and have even kept the massive, awe-inspiring Coconut Crab. Please read on to learn about their care and natural history, and be sure to post your own thoughts and experiences. The Purple-Pincher or Caribbean Hermit Crab (Coenobita clypeatus) is the most common pet trade species. It ranges throughout the Caribbean, reaching as far north as Florida and Bermuda.